Lady Eliza Sumner is on a mission. Her fortune was the last thing she had left after losing her father, her fiance, and her faith. Now, masquerading as Miss Eliza Sumner governess-at-large, she's determined to find the man who ran off with her fortune, reclaim the money, and head straight back to London. Mr. Hamilton Beckett, much to his chagrin, is the catch of the season, and all the eyes of New York society--all the female ones, at least--are on him. He has no plans to marry again, especially since his hands are full keeping his business afloat while raising his two children alone. Eliza's hapless attempts to regain her fortune unexpectedly put her right in Hamilton's path. The discovery of a common nemesis causes them to join forces and, before she knows it, Eliza has a whole retinue of people helping her. 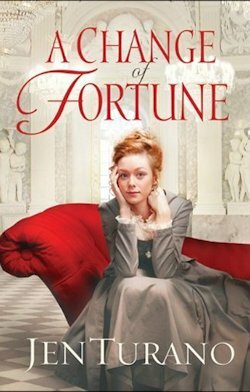 Eliza's determination not to trust anyone weakens when everyone's antics and bumbling efforts to assist her make her wonder if there might be more important things than her fortune and independence. When all of Hamilton's and Eliza's best-laid plans fall by the wayside, it will take a riot of complications for them to realize that God just might have had a better plan in mind all along. Well, it seems in all the chaos that is my house I managed to read my books for review out of order. So I only just started this one and have the next one done. Whoops! And I have really no idea what life was like back in 1880, but I'm kind of surprised that an upper class girl would travel from England by herself and be resourceful enough to find someone in New York. But maybe I'm being snobbish/snarky tonight. It is kind of funny the situations she gets into, so far all because of someone else's decisions. With that...if you would like to read the first chapter of A Change of Fortune, go HERE. 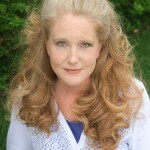 Jen Turano grew up in the small town of St. Clairsville, Ohio, where she spent an idyllic childhood riding her purple spider bike, ice-skating on a little pond and reading Nancy Drew and Trixie Beldon books in her tree house. High School was, surprisingly enough, fabulous as Jen spent time with her girlfriends. She headed off to college with no idea of what she wanted to be when she grew up, but settled on pursuing a career in fashion because she thought it sounded glamorous. Her parents thought she’d lost her mind, but they resigned themselves to her choice and after earning a BA degree in Clothing and Textiles, Jen set off to take the fashion world by storm, only to discover retail was certainly not the glamorous career she’d imagined it would be. She moved to Buffalo, New York to take a job in the buying office of a large department store, learning all there was to know about cookware, which again, was hardly glamorous, especially to a girl who did not have a knack for cooking. She met her future husband, Al, a few months after taking this job and eight months later, they were married. After moving into management at another department store and working that for a few years, the company went out of business and Jen decided she’d had enough. One year later her son was born and Jen hung up her heels for good and concentrated on being a mom. She began dabbling in writing when her son, then in elementary school, said he liked her made up stories as much as those in his books. It was then that she fired up the computer and never looked back. Jen loves to write humorous stories with quirky characters and a dash of intrigue and finds historical romances especially appealing, seeing as how she’s been reading them since she was a teenager. Her mother gave her a copy of Kathleen Woodiwiss, The Flame and the Flower, and Jen was hooked on the genre. When not reading romance, she loves to read mysteries, young adult and her favorite series of all time, Harry Potter. Besides writing, Jen enjoys spending time with her family and friends.